Growing up, my mom would give us a weekly head oil massage. We would keep the oil in our hair overnight and wash it the next morning. There are many benefits to these oil massages and I am so thankful to my mom for doing this for us through our childhood. Not only do these massages relieve tensions and aches but also increases blood circulation in the scalp and make our hair grow strong, smooth and lustrous. Heat up the oil so it is warm and apply it to your scalp and hair, gently massaging it in for 5-10 minutes. Leave it on for a couple hours or overnight and wash with shampoo once or twice to get all the oil out. Below are some of my favorite oils. Holi, one of my favorite holidays growing up, is known as the festival of colors or the festival of love. Holi signifyies the victory of good vs. evil and the beginning of Spring. Everyone wears white and throws colored powder on each other. Today, you can get any just about any color holi you desire but there are four main colors that have cultural significance. Green symbolizes new beginnings, red symbolizes love and fertility, blue is associated with Lord Krishna and symbolizes power and life and yellow is associated with healing power. There are three different Hindu legends that commemorate the festival of Holi. All three legends are dark and sad which is surprising since Holi is such a joyous holiday. The first legend is about the evil King Hiranyakashipu who forbid his son Prahlad from worshipping Lord Vishnu. He forced Prahlad to sit in a fire with his wicked Aunt Holika. Lord Vishnu protected Prahlad in the fire while Holika was burnt to death. The burning of the evil Holika is celebrated as Holi. The second legend involves Lord Shiva an the hours he spent in deep meditation. One day, Madana, the God of Love tried to test his dedication to meditation and appeared in front of him as a beautiful nymph. Shiva became angry and shot fire out of his third eye making her into ashes. The third Holi legend is about the love between Lord Krishna and Radha and Lord Krishna complaining to his mother about his dark skin while Radha's complexion was fair. His mother told him to apply color to Radha's skin to see how the color of her skin would change. Depressing legends aside, Holi is a super fun holiday filled with playful throwing of water and color on friends and family. It celebrates the beginning of Spring with beautiful color, laughter and joy! Mallung in Sri Lanka means to "mix up" and typically mixes up shredded leafy vegetables, coconut, onion, chiles, spices and lemon. Mallung is usually served with every Sri Lankan meal which consists of rice and curries. My mother-in-law's kale and coconut mallung recipe is my favorite! Mantras have played a very important role in my life. Growing up, our bedtime routine consisted of me and my sister, sitting with my mom, up right in her bed, mala in hand, reciting our favorite mantra. Once I left for college, I stopped this meditation practice. Recently, I decided to start meditating and using a mala again, and it has been life changing and has really helped me in my day to day. Here is a simple guide to meditating with a mala and below are some of my favorite mantras. You can also repeat a personal mantra during meditation such as "I can and I will", "Where I am right now is exactly where I need to be", and "I change my thoughts, I change my world". Today, we hear Om at the beginning and ending of each yoga class, but Om is the most sacred mantra in Hinduism. I often hear Om is "the sound of the universe". How can one word be the "sound of the universe"? Om, when chanted, vibrates at the same frequency found throughout everything in nature, 432 Hz. So when chanting Om, we are connecting to everything in our Universe. This is the perfect mantra to start the day and is often used as the universal prayer to send the message of peace and prosperity and to invoke blessings for harmony amongst each other. The literal translation is: May we be protected and nourished together; May we work with each other and may our studies illuminate us; May there be no dislike between us; Let there be peace, peace, peace. This is one of my favorite mantras, praying for inner peace. I am a strong believer that inner peace helps you treat yourself and those around you with love and kindness, which makes an impact on the world at large. In this mantra, Shanti (peace) is repeated three times which represents the threefold peace in ones entire being - body, mind and speech. My go-to mantra when I need a boost in self confidence. In this mantra, we honor Shiva, the Lord of destruction to call upon our higher self to aid in pure consciousness, enlightenment and the destruction of ego. This mantra is translated as "I honor the divinity within myself." Growing up, my mom meditated with a mala every night before bedtime. Many times, me and my sister would sit with my mom and repeat mantras with our own mala. A couple weeks ago, my mom gave me the same mala I used to meditate with when I was younger. It was the Mala my Nani (Grandma) gave to me 30+ years ago! My kids started asking me about the Mala, so I sat down with my mom to learn more. Malas are made from different gemstones, rocks or seeds. Buddhist and Hindu malas are usually made from different types of wood or seeds such as sandalwood, rosewood or rudraksha (one I am most used to). Rudraksha seeds are believed to embody peace and love and is considered a very holy and protective seed. HOW DO I USE MALA BEADS TO MEDITATE? Find a quiet and comfortable spot, close your eyes, take a deep breath and realign with your intention. I like to use a mantra during my meditation but this is optional. You can chant your mantra loudly or silently. Here are some of my favorite mantras. You can also repeat a word such as Om, love or something you are thankful for. Repeating this will help you with your concentration. Hold your mala over the third finger in your right hand and turn each bead towards you using your thumb. Your index finger (pointing finger) should not touch the mala beads. In Hindu tradition, the pointing finger is the accusing finger and is believed to represent ego. When you reach the guru bead (bead that hangs from the mala), wait and reflect. Do not continue over the guru bead. Turn your mala around and continue in the opposite direction. Continue this practice for as long as you want to. 2016 flew by so fast. My 2016 was filled with so many amazing (and not so amazing) moments. I am excited to see what 2017 brings! Cabo with no kids (missed them to pieces but had a blast)! I make a couple jars and keep them in the freezer. Add yogurt to the chutney and use it to marinade chicken overnight. Cook in on the grill and serve with rice, raita and a cucumber salad. I grew up celebrating Diwali as the festival of good over evil, the festival of King Rama defeating Ravana, the Demon King. Diwali is a celebration of King Rama's defeat but it is also a holiday that honors the Goddess of Wealth, Lakshmi. She is the goddess of prosperity, wealth, purity, generosity, and the embodiment of beauty, grace and charm. She is the wife of Lord Vishnu. Often times she is pictured as a beautiful woman standing in a lotus blossom with her four arms open and giving. She is worshipped to attain wealth, beauty and good luck. The lotus blossom stands for beauty, purity and fertility. Her four arms represent four spiritual virtues (Prosperity, Purity, Generosity, Energy). During Diwali, Hindus worship Goddess Lakshmi at home and pray for her blessings. It is believed that during Diwali, Goddess Lakshmi visits the homes and blesses the family and their business with with wealth and a successful year. People leave their windows and doors open so the Goddess can come in. Diyas (oil lamps) are lit so Lakshmi can find her way into your home. The Goddess Lakshmi is the household goddess of most Hindu families, and a favorite of women. Although she is worshiped daily in most Hindu households, Diwali is Goddess Lakshmi's holiday. Navratri is a nine day Hindu festival in mid October celebrating the victory of good over evil. During this festival, Goddess Durga, the mother Goddess, who symbolizes creative energy and the feminine body is worshipped in her three main forms - Saraswati, Parvati, and Lakshmi. Different regions in India have their own tradition in celebrating Navratri. I am Gujurati, and we celebrate Navratri doing Garbha (Indian folk dance) and Dandiya Raas (folk dance using sticks). During Garbha, women dressed in beautiful, colorful Lenghas, dance around a clay pot filled with water, a betel nut and a silver coin with a coconut placed on top of the pot. The clay pot symbolizes the womb, the source of life on earth. The nine days of Navratri are filled with pujas, fasting, meditation, singing and dancing, honoring the Mother Goddess and what she stands for, in her three forms. On the first three days, Goddess Durga is worshipped to destroy impurities, vices and defects. On day 4-6, Goddess Lakshmi, the Goddess of spiritual wealth is worshipped. On the last 3 days, Goddess Saraswati, the Goddess of wisdom is worshipped. We need blessings from all three aspects of the forms of the Mother Goddess be successful in life. Walk into all the trendy cafes in San Francisco and you can buy a turmeric latte for $7!! What the heck? Growing up, my mom would make me turmeric latte...aka Haldi Ka Doodh when I was sick, could not sleep or needed a pick me up. It is my moms go to Indian home remedy. Haldi ka Doodh is known to build immunity and fight against illnesses and is also well known in Ayurveda for its health benefits. Try my moms easy to make recipe below. Heat the milk along with the spices/ingredients for 2-3 minutes. Add the sweetener if you want. Strain and drink. I grew up Hindu, Jain and Buddhist went to a Christian school. Aspects of each religion have shaped me into the person I am today. In my recent years, I have been more drawn to Buddhism, and all it has to offer. I feel Buddhism is more of a "way of life" or philosophy. What is the Buddhist philosophy? The Four Noble Truths and the Noble Eightfold Path make up the basic concepts of Buddhism. Right mindfulness - have a body and mind awareness of the present moment. Be present. Don't be lost in daydreams, anticipation, indulgences, or worry. Right concentration - meditate to reach enlightenment. In summary, Buddhism is a philosophy rather than a religion where one is not worshiping a God but is focusing on the road to enlightenment, a state of being. Growing up, my mom would often make us Khichadi (kich-ah-ree), one of my favorite comfort foods. This simple mix of lentils, rice, vegetables and Indian spices was fed to us to bring us to health but little did I know that khichadi has many nourishing and cleansing benefits. It is considered one of the most healing meals in Ayurveda, because it balances all three doshas. Khichadi pulls toxins from your body, is high in protein and is extremely healing to your digestive tract and intestinal mucosa. Khichadi recipes vary depending on the region. Below is one of my favorite recipes. I enjoy it most with a spoon of ghee, yogurt and papadum. In a medium pot, sauté onion in oil over medium high heat for 2-3 minutes. Reduce heat to medium add ginger and garlic, and sauté a few minutes, until golden brown. Add spices, pepper, salt and stirring, toast for a few more minutes. Add soaked mung beans and rice. Add water and 2 cups chopped veggies bring to a good boil. Cover. Turn heat to low, and let simmer for 20 minutes. Check for doneness. Continue cooking for 5 to 10 more minutes if necessary. Some rice takes longer, and if you do not pre-soak your whole mung beans, you will need to add more water, which will change the recipe proportions and flavor…so try to soak if possible. Once it is done, mix with ghee and top with fresh diced tomato and fresh cilantro and a pinch of salt and pepper, and a squeeze of lemon or lime. What does Dosha mean? It is a term very familiar to those who practice Ayurveda, the holistic science of health focusing on the connection of mind and body. Dosha refers to the three energies that make up every individual, performing different physiological functions in the body. Every person has all three doshas but usually only one or two dominate. All three Doshas - Vata, Pitta and Kapha are important and can cause suffering when diet and lifestyle choices are not healthy. Knowing your Dosha can help you maintain balance, lasting health and peace of mind. Not sure what your Dosha type is? There are many questionnaires online. My favorite one is offered HERE. Once you know your Dosha type, you should follow a diet and lifestyle that works for your type. Below are personal characteristics as well as diet and lifestyle tips for each Dosha type. Cultivate the virtues of honesty, morality, kindness, generosity, and self-control. Choose foods that are light, warm, and spicy. Growing up, I often heard the word "Ayurvedic" or "Ayurveda" almost on a daily basis. "Ayurveda" is a wellness term that has become pretty trendy in recent years with bloggers, celebrities and alternative medicine experts. What exactly is this buzzword? Ayurveda is grounded in thousands of years of Indian tradition and is one of the oldest and most continuously practiced systems of medicine in the world focusing on the connection of mind and body. Ayurveda (Ayur = life, Veda = science or knowledge) is a science of life. Here are a few simple ways you can incorporate the principles of ancient Ayurveda into your busy and modern lifestyle to calm your mind, soul, body, spirit AND improve your overall physical health. Know your Dosha type and try to follow the diet and lifestyle routine that fits your mind/body constitution. Here are some of our favorite East Indian inspired cocktails that we love! A mix of unexpected flavors and textures in these cocktails will be sure to bring back memories of your annual trips to India. Muddle cucumber, cilantro, and chili in a cocktail shaker or mixing glass until well broken and slightly mashed. Add gin, lime, and simple syrup and shake vigorously. Strain into a double rocks glass, half filled with ice. Garnish with a slice of cucumber. Divide vodka mixture, ice, orange quarters, and pineapple quarters between 2 glasses. Spray the interior of a martini glass with Le Tourment Absinthe. Add all the ingredients to pint glass. Add ice, shake and strain into the martini glass. Crack fresh black pepper on the top of the drink and finish with a fennel frond. Chill a cocktail glass in the freezer. Combine ingredients in a mixing glass and add about 4 cubes of ice. Serve with mandarin orange skewer and add a sprig of mint. In a shaker or glass combine the tomato juice with the vodka, sherry, and Worcestershire sauces and a good pinch of celery salt, salt and pepper, tobasco (to taste) and the horseradish. Add a squeeze of lemon juice and stir well or shake. Taste and adjust seasoning if needed. Fill two glasses with the ice, then pour over the bloody Mary. Add a slice of lime and a sprinkling of fresh garam masala. Garnish with celery, olives and whatever else your heart desires. Why is traveling good for the soul? The greatest life experiences come from visiting other parts of the world and experiencing new things. What do we really get out of it? An escape from day to day demands. Who doesn't want to get away from their usual responsibilities? This is a time to disconnect from all of technology and soak in what your vacation spot has to offer. Experience new cultures. Food, language, people. Every place you go has something new for you to experience. Throw yourself into the local culture and learn things about other people and other places will help you learn things about yourself. Become a better you. You will experience things you have never seen before and might face challenges and opportunities that will make you a stronger person or spark a passion you never thought you had. Whether you are traveling to an underdeveloped country or going to Bali to hang out on the beach, traveling will shape you to be a better person. Growing up, my moms kitchen always had a 'masala dabba'. A round stainless steel container with a lid and 6-7 round containers inside with spices that are the most important spices used in Indian cooking. What I didn't realize until recently was that these spices along with ginger, garlic, onions and tomatoes are all you really need to make a delicious Indian dish. Below is a breakdown of the 6 most important spices used in Indian cooking. Black, tiny round balls commonly used in South and North Indian foods. You probably remember the loud, crackling sound they make when your mom throws them into hot oil to do 'tadka'. Tadka is a method used when seeds and spices are added to hot cooking oil causing the seeds and spices to crackle, bringing out their full flavor. These seeds are brown colored, oblong, bitter in taste with a distinctive aroma. Jeera is sprinkled in powder or whole seed form to various dishes. You might remember it being sprinkled into your chaas (yogurt shake) in whole form with salt. Jeera has Ayurvedic properties that can calm the digestive system. This bright red powder is added to most Indian dishes for heat and the beautiful red colors. Cayenne power also has a lot of therapeutic properties and is gaining a lot of buzz in the US for its uses in cleansing and detoxifying regimes such as the Master Cleanse. This powder is ground, roasted coriander seeds (super easy to make at home). This powder is used in most Indian cooking for flavor. Coriander powder is also used in various spice mixes such as Garam Masala and Sambar powder. I never realized how much cinnamon is used in savory Indian food. It is usually added to the beginning of a recipe during the 'tadka'. Cinnamon sticks are mixed into the hot oil, making a flavorful oil to cook the food in. Stay tuned for recipes using these important spices! How many of you still go to your moms house before an Indian party to get dressed? Saris are elegant and flattering but so confusing to put on. Below is a step by step guide. With some practice, you will become a sari wearing expert in no time. Your sari will have a plan end and a fancy end (pallu). Start with the plain end and tuck it into the right hand side of your belly button. Continue to tuck the edge of the sari into the petticoat for one full counter clockwise circle( right to left), ending at the right side of your belly button. Make sure the decorative part of the sari is facing outwards and the hem is touching the floor. Take the decorated end of your sari (pallu) and circle it around your body once, bringing it back to the front and placing it over your left shoulder. The pallu should land at the back of the knee joint. Take the remaining material closest to your body and make 5-7, 5 inch pleats. Tuck this into your petticoat towards the left side of your belly button. Use the safety pin to secure your sari. I like to put one on the shoulder, one to secure the pleat and petticoat and to secure the pleated section before tucking it into the petticoat. This past summer, I had the most amazing experience traveling to Bali, Indonesia. It was a place that healed my soul, before I even knew that my soul needed healing. An island known for its rice paddies, beaches, culture, volcanic mountains, temples, yoga and meditation. Here are some tips from my travels to Bingin Beach and Ubud. 8 beautiful suites to pick from - I stayed in the Eagle's Nest Suite. Beautiful ocean view, but steep steps down to the room and you might encounter monkeys on the way down. Amazing massages and spa - I got 2 massages a day. The Balinese massage was my favorite! Best food and restaurant - Amazing staff and chefs! Dinner was always family style with everyone staying at The Temple Lodge. My mornings always started with a fresh juice and an amazing breakfast dish off the menu. Make sure you get then fresh sambal to go with whatever you order. Great daily yoga and meditation - I thank The Temple Lodge for teaching me to love yoga and meditation. I am now a devotee. Lovely owners and staff - Amazing people. Full of love. My favorite part of The Temple Lodge. Gorgeous rooms, pool and grounds - My day consisted of spending time at the pool, yoga. massages and eating! 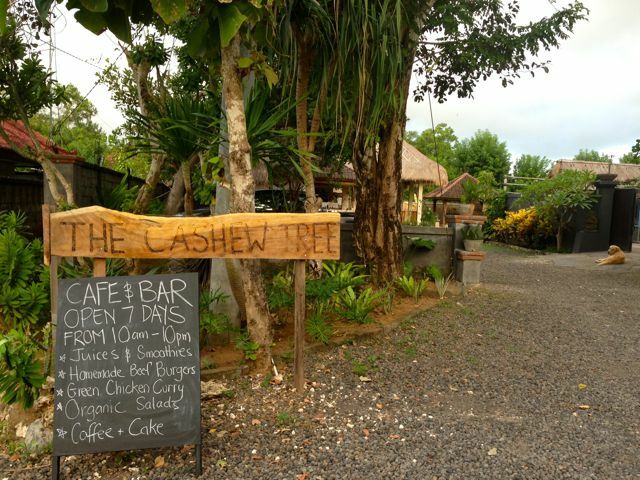 The Cashew Tree - great drinks, nightlife and food. Live music on Thursday nights. Great place to go with kids and a cute little playground to keep your little one happy. 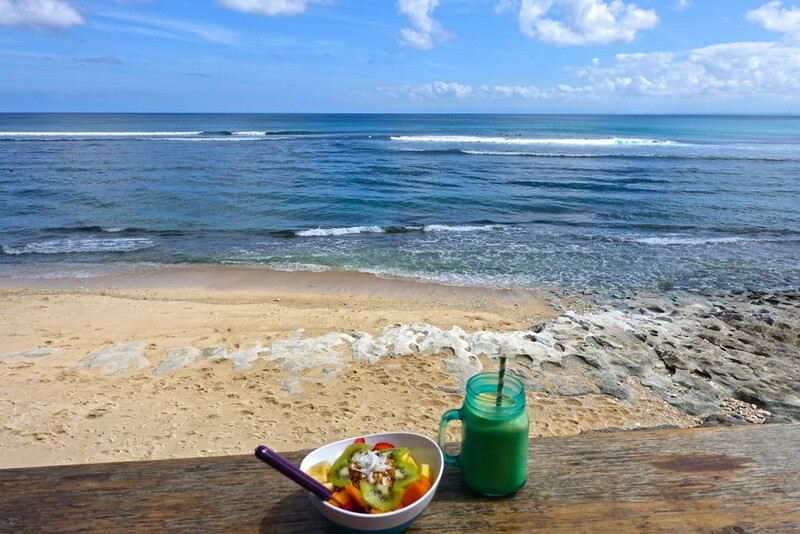 Kelly's Warung - Fun place on the beach with yummy smoothies and good drinks. Great place to see the sunset while drinking a Bintang. A surfers hangout and fun people watching. Fair Warung Bale - We found this place towards the end of our trip. The BEST Indonesian food we ate! Also, a great cause. They donate a portion of their profits to Public Healthcare. 1 meal = 2 free medical treatments and helps fund their new Pediatric hospital building. Elephant Caves Goa Gajah - you walk down a flight of stairs to discover caves from the 11th century, wall carvings, temples and bathing pools with fountains. Ubud Monkey Forest - beautiful grounds with monkeys everywhere. Tegallalang Rice Terraces - Breathtaking. Pictures do not do this justice. Gunung Kawi - Long walk down to beautiful temples carved into the cliffs, rice paddies and holy waters. Pura Tirtha Empul (holy waters) - A temple built in the 10th century known for its holy springs. Many locals travel to bathe in the waters for its curative powers. The Balinese believe a Hindu God, Indra, pierced the earth at this location to create the holy waters to revive his soldiers that had been poisoned by the demon king Mayadanawa. For as long as I can remember, I have had a running list of my bucket list, everything I wanted to do/accomplish before I die. I continue to add to my bucket list and hope I can one day cross everything off my bucket list.